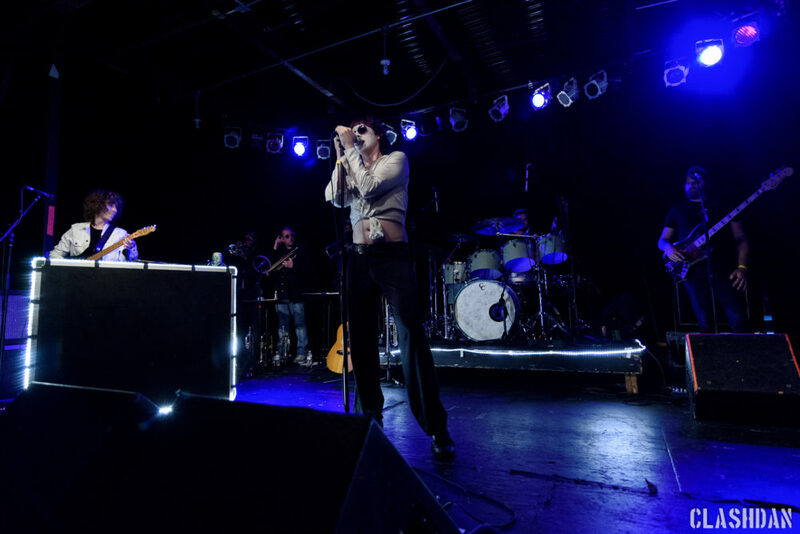 Back in 2015, California-based psych-pop rockers Foxygen embarked on what was announced as their “Farewell Tour.” While there had been threats of ending the band previously, by all appearances this time internal drama had taken its toll, leaving devoted fans and followers to lament the loss. Two subsequent years of inactivity served to confirm that the band was indeed done. But then, when even the most dedicated had given up hope, Foxygen returned earlier this year with their fourth full length album, the ambitious and theatrical Hang. Recorded to tape, the critically-acclaimed album features a forty-piece orchestra arranged by Matthew E White and Trey Pollard, as well as guest appearances by Steven Drozd from the Flaming Lips and members of The Lemon Twigs. With the new album under their belts, creative duo Jonathan Rado and Sam France pulled together a sizable group of talented musicians and have hit the tour trail. The outfit recently stopped at Cat’s Cradle in Carrboro NC. As the lights dropped and the crowd buzzed with anticipation, the members of Foxygen’s current touring band took their places across the stage and kicked off with “We Are the 21st Century Ambassadors of Peace & Magic.” Decked out in sunglasses and white face paint, lead singer Sam France captured the focus and attention of the crowd as he channeled early Stooges-era Iggy Pop. He slithered and danced around the stage and out toward the crowd with a swagger and movements that were reminiscent of Mick Jagger, even throwing in a few energetic kicks for good measure. The tight nine piece band, led by Jonathan Rado on keys and guitar, including a horn section and backup singer, kept pace as they continued with “San Francisco,” and “Shuggie,” before launching into the new album. Any questions about how the new songs would translate live were quickly put to rest as the band did an admirable job starting with album opener “Follow The Leader,” followed by the rest of the album in order, in its entirety. The ornate and complex arrangements of the songs from Hang were recreated with a lavish yet concise delivery. The theatrical set that included a costume change for lead singer France and his lovely backup singer, ended with Hang’s final track, “Rise Up.” The energy remained high throughout and the crowd responded with enthusiastic jumping and loud cheering. With applause echoing through the room, the band returned for a four song encore that started with “How Can You Really,” and ended with the crowd singing along to “On Blue Mountain.” After a few years away, it feels like Jonathan Rado and Sam France have returned to Foxygen with a renewed vigor and appreciation for their shared musical craftsmanship. The evening started with a set of Velvet Underground influenced, indie garage fuzz-pop, from Australian Gabriella Cohen. The frontwoman from rock band, The Furrs, played songs from her debut solo album, Full Closure and No Details, released in the US by Captured Tracks this past March. There was a celebratory yet equally melancholy feel to the set as Gabriella announced that the Cradle show was her last on the current Foxygen tour.